The core Ryson concept is to vertically convey using minimum floorspace. Although the concept is simple, it can be used in countless applications. The Ryson Concept has two main kinds of spirals. A Unit Load Type, and a Mass Flow Type. The unit load Spiral Conveyors smoothly handle boxes, totes, trays and cases and the Mass Flow Spirals convey materials such as cans, bottles and jars in bulk mass. They both come in standard capacity and high capacity – for applications that require extra throughput, weight handling or elevation change. The High Capacity Spirals can optionally be equipped with intermediate infeed or discharge locations, ideal for multi tiered order picking applications. Much of ryson’s business is in two main categories: Packaging /food & beverage / personal care products and warehousing / oder picking / distribution. Because of the diversity of applications, Ryson has developed several standard slat widths and each model’s footprint size is based on that. We are dedicated to finding the best spiral that fits your application needs. On the Ryson Website, we have a request for quotation form that you can fill out. It will ask you many questions about the application’s requirements. The Ryson sales team will then figure out the best model and have a quote to you within 24 hours. 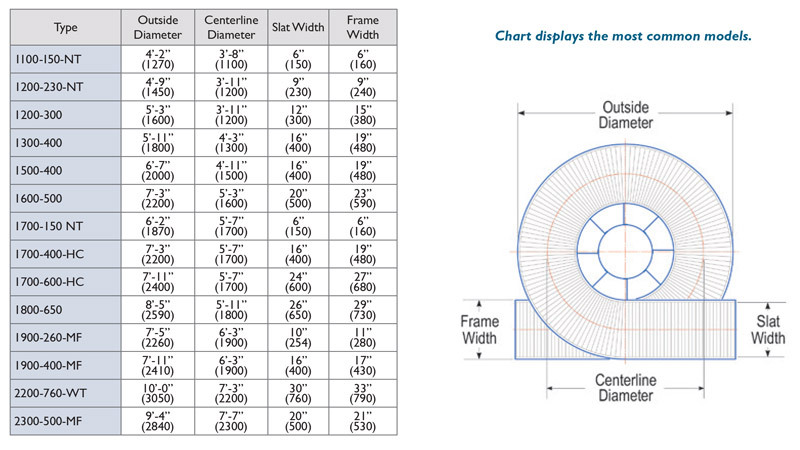 You can also download this sizing chart and RFQ form for your reference.